This program, recorded "live" at Jim's one-day Seminar, involves the student physically, emotionally and mentally. 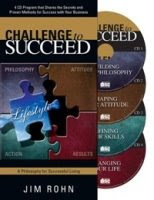 Five inspirational topics guide the participant through self-evaluation and commitment, including: the five major pieces to the life puzzle, the power of personal development, the fundamentals for prosperity and success, how to win the battle of the mind, attitude change and the day that turns your life around. If you wish to download for free, click here.